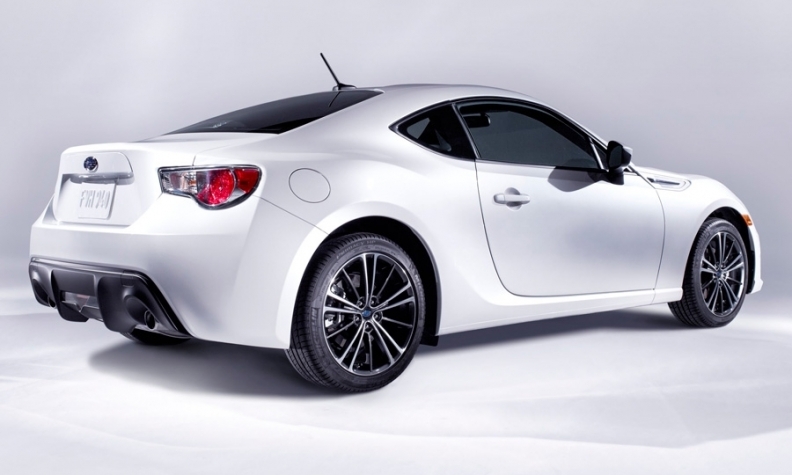 By lowering the engine, Subaru was able to lower everything on the BRZ, from the roofline and the hood to the seating position for the driver and passengers. We saw a "concept" BRZ at the Los Angeles auto show a couple weeks ago, and we'd seen various show cars and spy shots over the last couple of years. But now Subaru finally rolled out an undisguised, fully finished production version of its highly anticipated BRZ sports car at the Tokyo motor show. The big thing about the BRZ, what you'll be hearing a lot about from Subaru, is the car's center of gravity. It's low. The whole design was aimed at lowering the mass. At 200 hp it's strong but not a muscle car by any stretch, nor is it a supercar. It is a sports car in the old sense of being lightweight -- 2,700 pounds -- and it's delightful to drive. Or at least it promises on paper to be. We don't drive it until Friday. Subaru has long touted the low center of gravity benefits of its flat-four boxer engine, and the BRZ gets a boxer, too, an all-new "FA" 2.0-liter naturally aspirated four. But in the BRZ that engine sits even lower and farther back than in any other Subaru, nine inches further back compared with that in the Impreza. The center of gravity is just 18.1 inches in front and just slightly higher than that in the rear. By lowering the engine, Subaru was able to lower everything else, too, from the roofline and the hood to the seating position for the driver and passengers. The resulting smaller roll moment reduces body roll and allows greater grip on what will be the car's standard summer tires, Subaru says. There will be no all-season tires available at launch. The powerplant has its own block, head, connecting rods and pistons. High performance also means a 7,450-rpm redline, 12.5:1 compression ratio and roller rocker valvetrain. It has a square 86-by-86-millimeter bore and stroke, and Toyota's D4S fuel injection. Under low loads it runs an Atkinson cycle to increase fuel efficiency. The torque hits 150 lb-ft at 3,000 rpm and again from 5,000 rpm to 7,000 rpm. There is no room for a turbocharger, Subaru says. All of which sounds very promising.